^ 2.0 2.1 DeFrancis (1984), p. 155–156. ^ 3.0 3.1 3.2 胡適. 白話文學史. 百花文藝出版社. ISBN 7530632493. ^ DeFrancis (1984), p. 154. ^ DeFrancis (1984), p. 177–188. ^ DeFrancis (1984), p. 84. 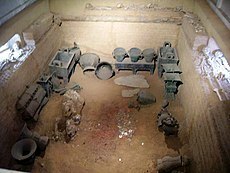 ^ Thorp, Robert L. "The Date of Tomb 5 at Yinxu, Anyang: A Review Article," Artibus Asiae (Volume 43, Number 3, 1981): 239–246. Page 240 & 245. ^ Simon Ager. Japanese (Nihongo). Omniglot. 2007 [2007-09-05]. ^ Wan Shun Eva Lam. Second Language Socialization in a Bilingual Chat Room: Global and Local Considerations. Learning, Language, and Technology. 2004, 8 (3). ^ User's Manual of the Romanization of Minnanyu/Hokkien Spoken in Taiwan Region. Republic of China (Taiwan) Ministry of Education. 2009 [2009-08-24]. （原始内容存档于2011-08-15）. ^ 書同文:《漢字簡化方案》制訂始末. 北京日報. 2008年6月3日 （中文（中国大陆）‎）. ^ 回族的語言和文字. 寧夏旅遊網. 2005年8月21日 [2008年5月25日]. （原始内容存档于2008年6月23日） （中文（中国大陆）‎）. ^ 中國最早的中文拼音—小經文字. 寧夏新聞網. 2004年8月4日 [2008年5月25日]. （原始内容存档于2005年11月24日） （中文（中国大陆）‎）. ^ 回族語言文字習俗傳承. 華夏經緯網. 2004年4月22日 [2008年5月25日] （中文（中国大陆）‎）. J Björkstén. Learn to Write Chinese Characters. Yale University Press. 1994. ISBN 0-300-05771-7. John DeFrancis. Advanced Chinese Reader. The Murray Printing Co. 1968. ISBN 0-300-01083-4. John DeFrancis. The Chinese Language: Fact and Fantasy. University of Hawaii Press. 1984. ISBN 0-8248-0866-5. William McNaughton and Li Ying. Reading and Writing Chinese. Tuttle Publishing. 1999. ISBN 0-8048-3206-4. Jerry Norman. Chinese. Cambridge University Press. 1988. ISBN 0-521-29653-6. S Robert Ramsey. The Languages of China. Princeton University Press. 1987. ISBN 0-691-01468-X.